I brought the hot water mug with me from home. It’s really useful and I use it all the time. 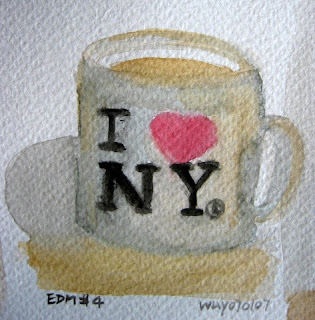 The ‘I heart NY’ mug was a gift from cousin, she gave it to me when came to visit last time. These were actually from last night, I made some herbal tea and thought that I might as well do another EDM sketches. 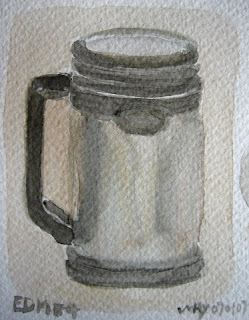 Painted the “I <3 NY" mug first, and totally messed it up :) Then I painted the hot water mug and I think it’s better… It’s sooo hard to paint white and shadow and reflections! !